Tales of a summer with a 91 (now 95!) year old: Let summer begin! 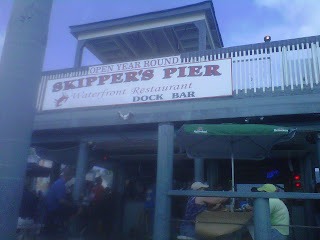 Today found John and I jetskiing across the bay from Harrington Harbor North over to a bar by Ron's marina - Thursday's. A few cocktails later, we zoomed off to Harrington Harbor South where there wasn't a spot to dock the ski (what is up with that?!). So, we just headed back to friendly Skipper's Pier which is right across from John's marina. One cocktail later and we had a little nap on Namaste before I had to head home. All in all, a delightful way to start the summer on the Chesapeake! Tomorrow will find Bobbi, Jeff, John and me heading out on Namaste to Harrison's Restaurant for a crab feast lunch. These are the good old days!